Hi! 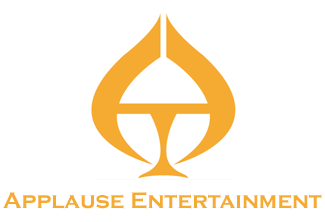 Have you spoken to Applause Entertainment at (604) 503-5035? Event Name* This field is required E.G. "Sam's 50th Anniversary", "Ryan's 1st Birthday"
Event Venue* This field is required E.G. "Sky Zone Surrey", "Aria Banquet", "13498 73 Ave"
Event Start Time* This field is required When does your event start? Michael's Start Time?... * This field is required Showtime? Details... Product / Theme? Special Request? No. of Guests? I would like to pay by...* This field is required We accept Debit, Credit, Cash, Cheque, E-Transfer. This is a contract for the professional services of Michael Dinero ("Artist") made between You ("Purchaser") and Applause Entertainment Inc. ("Agent") for the event described. The ("Agent") agrees to provide services according to the terms and conditions listed. The ("Purchaser") agrees to provide an honest review of ("Artist's") performance upon request. This contract cannot be cancelled 1 month prior to the event date. I agree to pay in full all financial obligations including travel expenses (if applicable) due to 'Applause Entertainment' prior to the performance. I agree to make cheques (if applicable) payable to: Applause Entertainment Inc. I agree to keep rates and prices confidential as my breach is liable to legal action. I understand and agree to pay a 50% deposit upon submitting this form to demonstrate my commitment and reserve my booking for the date/time of my event for Michael Dinero ("Artist") via Applause Entertainment Inc. ("Agent").